Contact privacy levels allow you to control the visibility and access to contacts across your firm. The client details and work are public by default and everyone in the team has access to it. 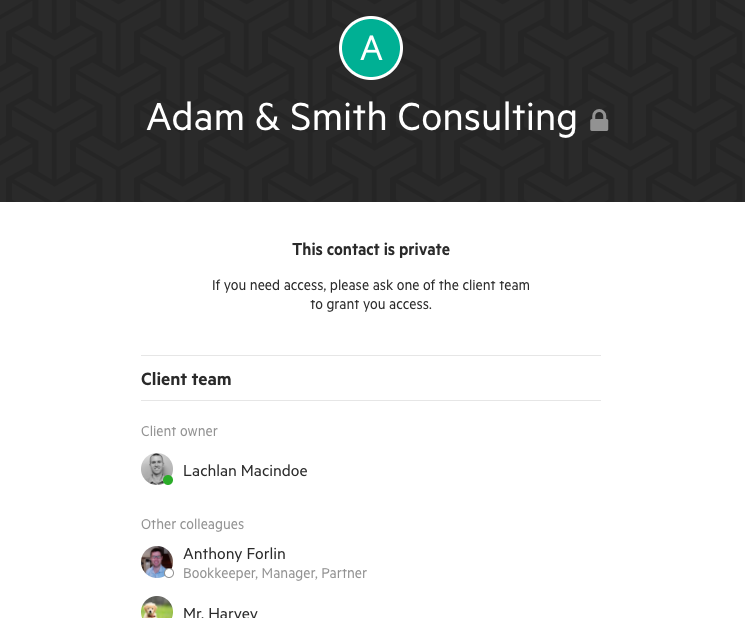 Only the client team will have access to the contact. The contact and their work will still show in search results, on work lists and on your Kanban board. Colleagues without access can still see the client and work names but not details or communication. If you are assigned a task in a piece of work for a private contact, only the client team will be able to see the task on your to-do. If someone who has not been granted access attempts to view a private item, they will see a message letting them know who to reach out if they feel they need access. If you are assigned a task, note or email on a hidden work item, only those with access to that work item will be able to see those tasks in your to-do list. Scheduled work for a hidden client will also be hidden.